EZ ON/OFF I-44 AND OK-7! 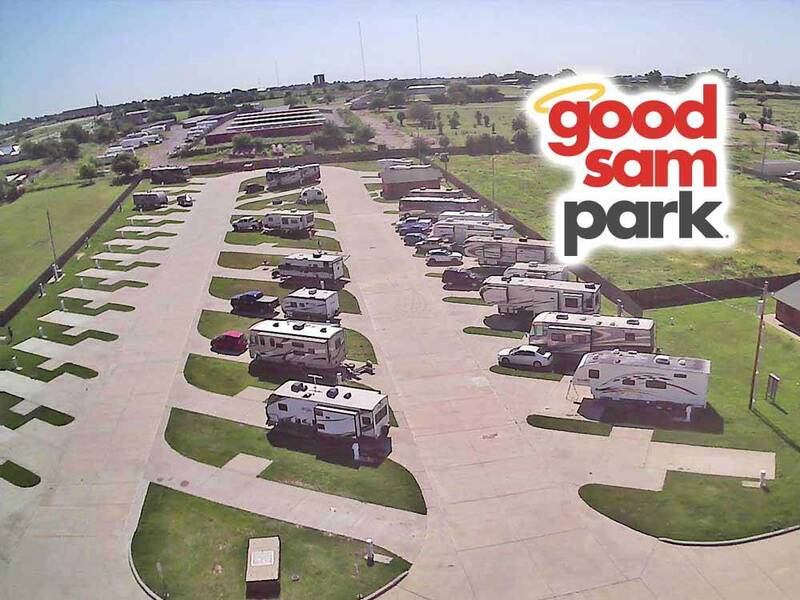 Near Fort Sill; Relax at SW Oklahoma's premier RV park. Enjoy the Lawton-Fort Sill attractions then come home to paved roads & FHU pull thru sites, large rec room w/pool table & exercise equip, FREE laundry & storm shelter! Road ways are concrete and very wide. Pads are concrete and reasonably level. Utility posts are well located. Clubhouse and restrooms inside are nice and clean. However, main showroom and restrooms were very dirty. Upon check-in we did not receive a grounds map. Had to search around to find the trash (which is located just south of the office). Site pads have an attached patio area but no picnic tables. No pool or playground. Stayed here a week for military reunion. RV park is right of I44 and very close to Lawton/Fort Sill and area activities which is why we camped there. Actual RV sites were fine with concrete level pads, decent space between sites however no shade or trees in park, with water pressure and electricity being very good. Park amenities beyond actual sites sucked. Owners/managers were never around - only contact was a phone number. Wife used free laundry twice and trash was still there 4 days later and the rec room had bugs on floor the entire time. Checked washrooms/showers and would never use them. Problem with park is that NO maintenance/cleaning was ever done to buildings when we were there. Owners/managers seem to have no interest in park other than your money. Will only stay again because closeness to Fort Sill. We camped at Buffalo Bob's RV Park in a Motorhome. Buffalo Bob's is situated just East of Lawton in a rural area. The park is quiet and clean, and looks fairly new. Access is excellent - the park is only about 1/4 mile off a four-lane highway. Roads and pads are all concrete, wide, and are in excellent condition. The grass had been freshly mowed. Bob's provided a cable TV box, but the park host/manager seemed less than enthusiastic about helping out when we (two engineers) had difficulty figuring out how to make it work. They advertise having ice, but all they have is a small residential ice maker in the rec hall which was almost empty. There was no landscaping, there were no trees, and no picnic tables at any of the sites. We stayed her while attending our Grandson's graduation from Boot Camp at Ft Sill. The park is set up with level concrete pads and is a quiet park. Not the best location, but just for a place to stay it worked well and the price was good. Free laundry, restrooms were clean, and the game room was nice. The only issue was the park managers were not very personable, when we showed up it seemed like a bother to check us in, and that's the last interaction we had with them.